So I have made my first AC power shield design for the Arduino. * the on/off high voltage circuitry in the middel of the board, with a safety distance of 2-5mm to all the low voltage parts. On the prototype I have covered all the high voltage parts with heat resistant kapton tape, to make it fumble finger safe. * opto-coupler with mini triac is operating between the high and low voltage section. Optocoupler MOC3041 has zero-detection. Optocoupler MOC3020/21 (no zero-detection) can be used if light show control effects are needed. * easy selection of which pin on the Arduino controls the on/off function (J4). * on-board temperature sensor LM335 making it possible to incorporate a temperature safety system/switch when operating higher loads, so an override OFF operation can be made if the chip/board becomes too hot. Without additional cooling of the Triac should probably not control more than max. 3 Amp loads, where as the Triac it self (BT138) is a 12Amp design, and BT139 is a 16Amp design. With higher than 3Amp loads one should however use better cooling. As much as 20W cooling could be needed. * on-board NTC connector. If used to control a reflow oven, one needs a temp sensor that can go as high as 270 *C. By not mounting the 10uF (C2), another LM335 can be used for external low level (<100*C) but easy temp sensing. * the design should be single sided PCB, so its easy to make a copy yourself. * all drilled holes can be 1mm as its easy to get drills at that size at any hardware store, so its easy to make a copy yourself. * all wires are at least 1mm thick, so its easy to make a copy yourself. 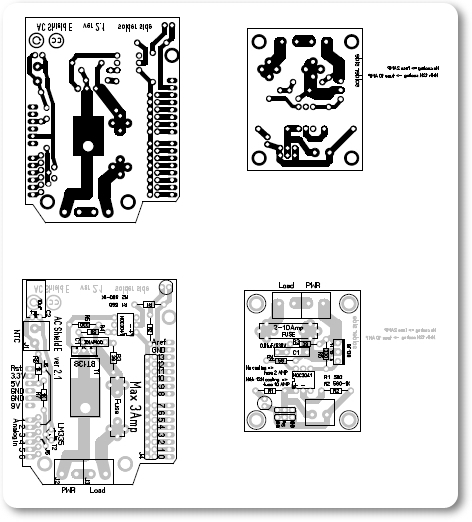 When I have tested a prototype further, I'll make the .pdf files available, so its easy to make your own copy on a PCB. hmm, cant post links or pictures in the first post. Looks like a nice design and of course very useful. However I've never been a fan of mixing high voltage AC and digital logic physically onto the same circuit board, especially when it's a standard Arduino shield type and keeping in mind the broad variation in experience that the Arduino population includes. I would rather the high voltage section be mounted separately with proper safety coverings, etc. The use of optical couplers does cover the electrical safety aspects but not the physical separation requirements. In the refinery I worked on we were required to use separate field conduits and junction boxes for control wiring and components (24v and under) and power voltages (120vac and higher). Just too many chances for worst problems when human error enters the picture as it always will from time to time. * the control connector follows the same scheme as servos. I'll make a shield so its easy to control many units using this kind of connector. Sort of like RoboDuino. I am thinking of stuff like temp sensors, relays, buttons and maybe more. could you use this shield to drive nixie tubes? (usually around 120-150v)? Nixie tubes are normally DC, while you can turn on DC with a triac you can't turn it off. If I were to do this... I would have all the low voltage parts on the shield and then use a single wire pair to control an SSR in a remote box that is totally enclosed. Sounds good to me but I have sometimes problems understanding the PCB files and therefore prefer to see the circuit in the design. Would you make that available to the community? I am about to work on something like this for my home automation project. It shall switch on / off the light in my garden and manage magnetic valves (which is a different design). I am still thinking about a board to interface with various actors and sensors. @jog_baer70: Sounds like a very interesting project. About schematics, I do not yet have a program that I find easy to use, but when I do, I'll gladly share. This design originates from some time in the 1980's. New technology using MOS designs has been made available, as SSR's - I'll be looking into these new designs. One major advantage to SSR MOS designs are that you no longer loose 1.2W per Amp over a Triac. The triac design has the advantage of being relatively low-cost to implement. Anyone has some SSR recommendations? As you can see, there is a shield and a separate AC board. The PDF file should print so its optimal for PCB production. Let me know how it works out. If need be, I can make you a PCB, as we have PCB production facilities at my hacker space: http://labitat.dk. The bottom part of the pdf print is a guide that should make it easier to couple drilled holes with correct placement of parts.